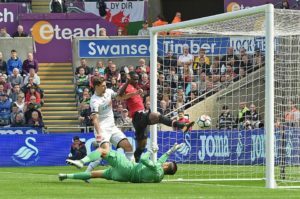 For 80 minutes the Swans were resilient and spirited, but Paul Clement’s limited squad were eventually ruthlessly exposed by a rampant United. Bartley, Fernandez and Mawson marshalled the United strike force well until a change in formation and tactics opened the floodgates. Mesa found the pace of the game too quick and Fer was well, poor. Ayew was arguably our biggest attacking threat but make no doubt about it, we need to strengthen and quickly. What did you think of the game? Let us know via the SCFC2 Guestbook.